After the Wellington Phoenix’s 1-0 win over Sydney FC, the Melbourne Heart remain the only side in this season’s A-League without a win. Unlike John Aloisi, however, Ernie Merrick has constantly tinkered with his side’s approach and formation, and made two changes to the side that played just 72 hours earlier against the defending champions in Gosford – Carlos Hernandez and Paul Ifil returned to the starting lineup in place of Jason Hicks and Jeremy Brockie. More importantly, Merrick elected to return to the diamond formation he started with against the Mariners (having switched to 4-2-3-1 midway through the second half), although now with Hernandez playing in behind the strikers (rather than Hicks), there was a more ‘natural’ feel to the side. Sydney FC, it’s worth noting, continued with a system similar in terms of shape to the Mariners, with the wide players of a 4-2-3-1 dropping back to form two banks of four without the ball. In terms of the formation battle, there was a clear advantage for the Mariners when the Thursday night game featured a 4-3-1-2 v 4-2-3-1 – with no natural width high up the pitch, the full-backs, Storm Roux and Joshua Rose, were constantly free to get forward on the overlap, as they had no direct opponent. Fittingly, Roux scored the only goal from an (admittedly fortunate) rebound in the penalty box, although it’s significant that he had so much space to whip the ball into the box in the first place. When Wellington switched to 4-2-3-1 – which seemed more of an attempt to get more attacking players on the pitch rather than a deliberate counter-move to the pattern of the game (as you feel, Merrick, who’s not been afraid of making early subs to instigate formation switches this season, would’ve rectified the issue earlier) – the influence of Roux and Rose waned, although the context of the scoreline, with Wellington chasing the game, can’t be ignored. Nevertheless, Merrick pursued with the diamond against Sydney FC, and yet again, the opposition full-backs were the freest players, and indeed, Ali Abbas and Pedj Bojic recorded high pass completion statistics, with the former ranking highest overall for the game…. …and it’s worth remembering that Bojic was substituted off for the final thirty minutes. In isolation, that change was bizarre – a natural centre-back for a right-back when chasing the game does little for attacking impetus and hardly impresses the fans – and in the context of the formation battle, it was particularly odd, considering the space both Sydney full-backs had ahead of them when in possession. In fact, Bojic and Abbas featured in Sydney’s top nine pass combinations against the Phoenix, illustrating how much their attacks were being built down the flanks. The flip side of this, though, is that the ‘vacant’ flanks naturally invites Wellington’s own full-backs forward to provide the width otherwise absent, and this has particularly benefited Louie Fenton. Redeployed as a right-back by Merrick after emerging as a right-winger last season, he’s grown into the position after a difficult start, and the contrast between two clashes against Perth Glory are a useful illustration of this – back in October, he was constantly overpowered by Sidnei’s tricky dribbling and promptly removed at half-time, but coped far better in the ‘return leg’ two weeks ago and in fact ended as the most prolific tackler of the match. While Fenton’s defensive ability certainly needed improvement, his attacking output was never in question. Against the Central Coast he got forward throughout the second half to overlap past Ifil and link up nicely down the side, sending in a couple of dangerous looking crosses. Again, against Sydney, he was a threat with his forward running, and should have had an assist when Stijn Huysegems spurned his ball across the face of goal at the far post. 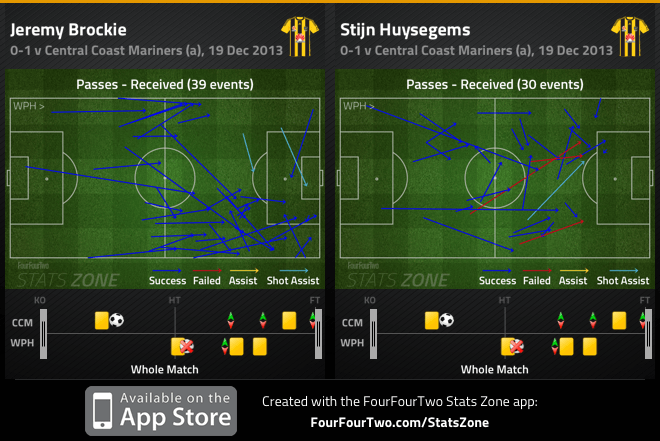 Jeremy Brockie’s drifts across to the right flank also helped create overloads down Fenton’s flank – the contrast with Stijn Huysegems, who stayed more central, is statistically corroborated below. Whether by design or accident, Wellington have a nice balance to their full-back play in the fact that Manny Muscat is more conservative on the left, focusing more on the ‘defensive’ side of things (which sounds ludicrous considering a left-back is, by trade, a defender, but shows the changing role of the full-back in modern football). Muscat is not ‘out of position’ per se having featured at right-back for most of last season as a temporary solution to a recurring problem position for the Phoenix, but Merrick was keen to restore him to his natural central midfield role when taking over in the winter. Parkin also suggests there is a similar balance higher up the pitch with the two outside players of the three man midfield, which was Kenny Cunningham and Vince Lia in both matches. Albert Riera sits in between them, sometimes moving forward to unmarked free opponents, but generally sitting deep and protecting the defence. Riera’s also good technically, and distributes the ball calmly (more on that below). Cunningham has a more proactive role to his left – originally signed as a winger, it was surprising to see Merrick push him back into a deeper midfield role against Perth (in the 4-2-3-1 to 4-3-3 mid-game change the Phoenix have been forced into multiple times this season), considering it was Cunningham’s lax defensive work causing the initial problems with the original formation. Yet he’s proven disciplined enough with his positioning, and in fact has added an extra dimension to Wellington’s attacks with his 3rd man runs from deep. To the right of the midfield trio is Vince Lia, playing a much more defensive role and tucking in alongside Riera to scrap in the midfield zone. There’s a neat ‘symmetry’ to the side, then, as Fenton goes forward with Lia covering down the right, and Cunningham darting into attack safe in the knowledge Muscat is protecting the left. Having three midfielders is also very useful defensively, obviously – there’s simply more players behind the ball at transitions, who help funnel attacks out wide into less dangerous areas. They also help to narrow the space between the lines during longer periods without the ball, which has been a recurring problem for the Phoenix in recent seasons, particularly against Melbourne Victory. An important facet of the Phoenix under Merrick that shouldn’t be understated is the improvement of passing through midfield. In most matches now, one of the most frequent passing combination will inevitably be between Lia and Hernandez, or Riera to an attacking player, illustrating the midfield’s tendency to receive the ball facing forwards and to pass forward positively into the final third. It would be comforting for Merrick, too, knowing that the other players in his squad are capable of backing up these positions – Hicks, for example, could play the Cunningham role, or even behind the strikers as he did against the Mariners, while you feel Caira could be asked to play a more defensive role at left-back, which would allow Muscat back into midfield. Furthermore, with Cunningham in the side, it gives Merrick the flexibility to switch between 4-3-1-2, 4-2-3-1 and 4-3-3, as has been common, seeing as the Costa Rican can cover multiple positions within those formations and thus negating the need for an early substitution that can otherwise be used later in a match. As has been noted previously on Australia Scout, the A-League lacks for true tactical variety, and in that regard, this 4-4-2 diamond piques more interest than is probably warranted – but Merrick deserves praise for adapting his tactics to suit his squad, with the current personnel in this new formation certainly creating a neat balance, even if the symmetry so commonplace in formations is not quite present. Having struggled for wins and consistency this season, there’s little doubt Merrick will pursue with this formation for the time being. The use of a proper strike partnership creates particular intrigue – they’ve gone rather out of fashion in the league in recent years, and Wellington might do well by simply presenting a different challenge to defences.